readily said "A carrot cake". I thought of a Martha Stewart carrot cake recipe that I had made for Easter a couple of years ago, which was very well-received. I really wanted to cut a wedge from the cake and take a photo, but didn't think that would look too nice when it was delivered. It was a 2-layer 8-inch round cake, with orange cream-cheese frosting. Yes, it's as good as it sounds. I hope the cake was as enjoyable to eat as it was to make! If you haven't decided on a dessert for Easter yet, you really ought to consider this cake. With the marzipan carrots arrayed on top, it has a bit of a "wow factor" when it's brought to the table, and the orange zest and fresh grated ginger add a nice flavor boost. 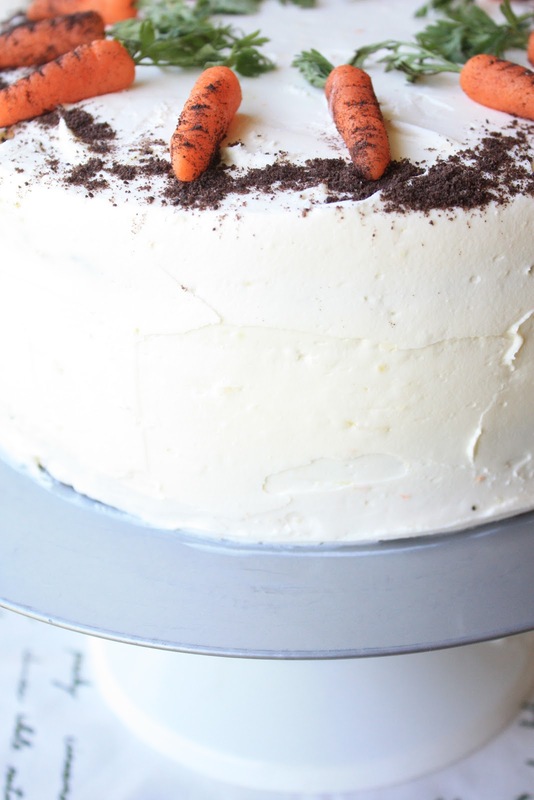 Of course, carrot cake is a favorite choice for any time of the year. Heat oven to 375 degrees. Butter two 8-by-2-inch round cake pans. Dust pans with flour, and tap out any excess. Set pans aside. Spread pecans in a single layer on an ungreased baking pan, and toast in the oven until lightly golden, about 10 minutes. Remove pan from oven, and let stand until completely cool. Reduce temperature to 350 degrees. Finely chop pecans, and set aside. Using the smallest holes (less than 1/4 inch in diameter) of a box grater, grate carrots, yielding 2 1/2 cups. Place carrots, eggs, buttermilk, vanilla, sugar, vegetable oil, and ginger in a large bowl; whisk until well combined. In a medium bowl, whisk together flour, baking powder, baking soda, salt, and cinnamon. Using a rubber spatula, fold the flour mixture into the carrot mixture until combined. Fold in the toasted pecans. Divide batter between the two cake pans, and bake until a cake tester inserted into the middles comes out clean, about 1 hour. Remove pans from oven, and transfer to a wire rack to cool, 15 minutes. Turn cakes out onto rack; let stand until completely cool. Place one layer on cake stand and add some frosting. Place second layer on top and completely frost the rest of the cake. I then dusted around the entire edge of the cake with some of the ground chocolate cookie crumbs(from marzipan carrot directions). Transfer to refrigerator and chill at least 4 hours or up to 4 days, covered with a cake dome. When ready to serve, place marzipan carrots around the edge of the cake. Using a serrated knife, trim tops of the cakes so surfaces are level. Slice each layer in half horizontally. Place a layer on a cake stand or cardboard round, and spread 3/4 cup frosting over top. Place a second cake layer on top, and spread with another 3/4 cup frosting. Repeat with third layer and another 3/4 cup frosting. Place last cake layer on top, and spread the remaining frosting over the top and the sides of the assembled cake. Transfer to refrigerator, and chill 3 to 4 hours, or up to 4 days, covered with a cake dome. Place butter in bowl of an electric mixer fitted with the paddle attachment, and beat on medium-high speed until fluffy, about 2 minutes. Add cream cheese, and beat until well combined and fluffy, about 2 minutes more. Add sugar, orange zest, ginger, and salt, and beat for 5 minutes. With a toothpick, add a dash of food coloring to the marzipan and knead with fingers to combine, continue until desired shade is achieved. Shape a teaspoon of marzipan into 12 balls, and place on a clean work surface. using your hands, roll each piece back and forth ( I had better success rolling it between the palms of my hands) to form a 2-inch log. Using your fingers, shape one end of each log into a tapered point to form a carrot shape. Use the tip of a skewer or toothpick (that's what I used) to make a small hole at the top of each carrot. using a paring knife, make small grooves across (working down) the surface or each carrot. Carrots can be kept at room temperature, in an airtight container, for up to one week. When ready to serve, roll carrots in cookie crumbs, lightly brushing of excess, and insert carrot greens into the holes. This cake is a labor of love and is well worth the effort! I love love love that you dirtied up the carrots! So adorable!! Sue, this is a piece of artwork! Love those little marzipan carrots you made...very professional. sue, wow even without the pic of the inside this looks so yum! I have to try this recipe...and yes love the real carrot greens you used! I'm officially in LOVE. What a beauty of a cake. You are incredible. The flavors of this cake are totally up my alley, ginger and orange, beautiful, just beautiful and I shall add you totally fooled me with your carrots, they look like a real thing. Really a wonderful work Sue. That cake is amazing and those carrots just put it over the top. How nice of you to make that for your friend :) My mom's favorite cake is carrot cake so I am going to save this recipe for her birthday! 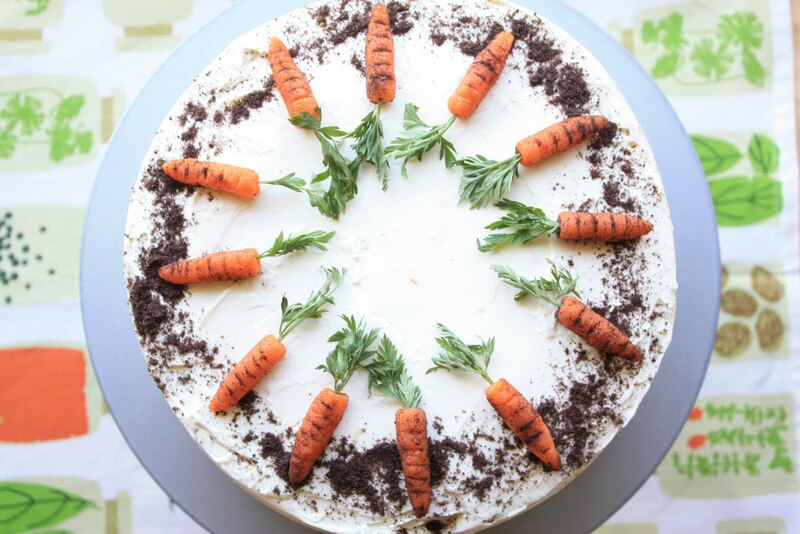 What a lovely cake ... sounds yummy and looks great ... i love the carrots and the dirt!!! These pictures, and your cake, are just perfection. Well done! This looks incredible! I love your carrots (no wonder you had fun decorating this cake) and the "dirt" as well. I bet he is so pleased he helped you out. Lucky! I think at the end of the day he is a happy lucky guy for having to eat this delicious carrot cake and the special carrot marzipan! What a wonderful blog you have! Following you now from Tasty Tuesdays! Would appreciate a follow back on Pinay in Texas Cooking Corner. I love the Marzipan carrots. I made a carrot cake recently (can check it out on my blog), but I used chocolate to make a carrot. I LOVE Marzipan, thanks for the idea! Those carrots look so real that at first I wondered if you had lost your mind and put real carrots on top of the cake (not seriously, but still, they were So lifelike!!). This is beautiful! I totally thought those were real carrots at first! Prettiest carrot cake I have ever seen.!!! you had me fooled with those carrots. they look completely real...the dirt and all!! amazing! Wow this cake looks amazing! I am still very undecided about what I should bake for Easter! I made a carrot cake last year ... and I kinda like it ... but ... Making the same cake every year also gets kinda boring. Oh my! I love carrot cake and this is a beauty! The orange cream cheese frosting sounds divine! I'm sure your friend was thrilled! Sue, You are always very talented in term of cake decorating. 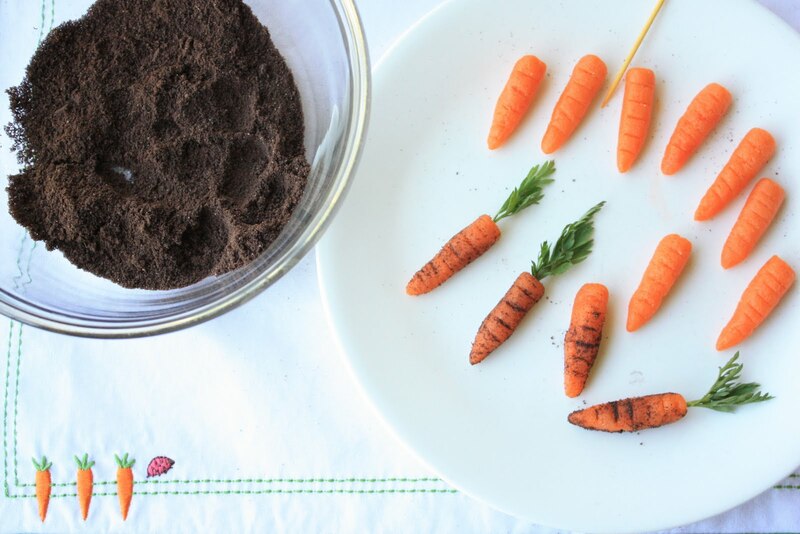 I love your idea of using ground chocolate wafer as "dirt" to sprinkle on your "home-grown" carrots. Wow! This looks amazing!! You rocked the carrots and I can only imagine how delicious it must have tasted :) Well done! I just swooned when I saw these photos. I love carrot cake, and those marzipan carrots are adorable! I adore carrot cake! You know what, you fooled me as well :) I am definitely makingthis for the boys. 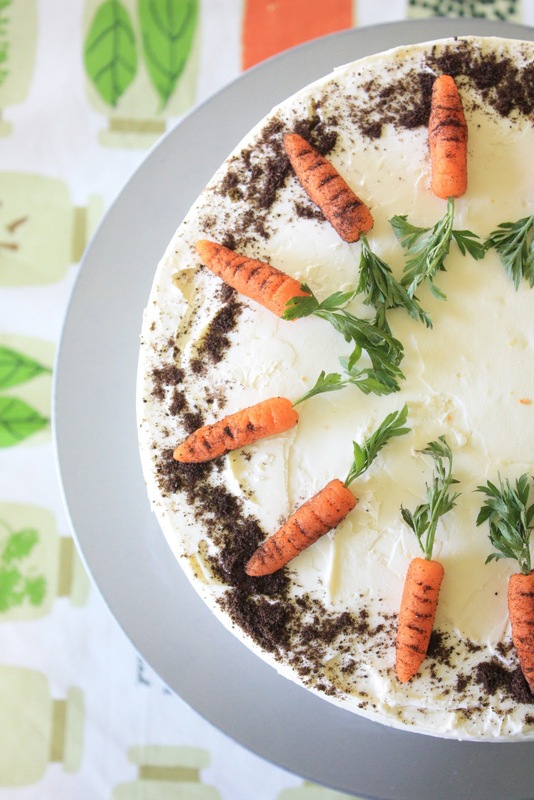 Your cake is a work of art and those marzipan carrots are oh so cute. I'm definitely learning a lot from you. Your photos are amazing and even if we can't see the inside of the cake, it's easy to tell this is an awesome creation!!!! Did you make another for yourself? This looks wonderful. I love the combination of ginger and carrots. If you get a sec, pop on over to Foodie Friday and link up! The cake is stunning and now will try to make marzipan carrots as well. The orange cream cheese frosting sounds like the perfect topping to the carrot cake. First of all, thank you Sue for looking up my blog. What a beautiful cake, I love all these little carrots made from marzipan. Thanks for sharing. Happy Easter! Your decorated carrots are absolutely amazing.....We'd love to invite you to come on by and link it up, if you wish to THIS WEEK'S CRAVINGS "Easter Cookies & Treats"
I just had to let you know - I made this cake for Easter Sunday dinner, only I turned it into cupcakes! They turned out SO cute! Everyone thought the carrots were real, and were scared to eat them at first! Thanks for the great receipe/idea! Hello :) I love the flavours of that cake and I´ll probably try to bake it! I always use parsley for the green part of my "carrots". It doesn´t give the marzipan a bad taste an looks "fresher"!